The record is made up of 4 folios. It was created in 11 Sep 1873. It was written in English. The original is part of the British Library: India Office The department of the British Government to which the Government of India reported between 1858 and 1947. The successor to the Court of Directors. Records and Private Papers. Letter congratulating Pelly on his departure from the Persian Gulf Historically used by the British to refer to the sea area between the Arabian Peninsula and Iran. Often referred to as The Gulf or the Arabian Gulf. and his new appointment in Rajputana [Rājasthān]. The letter goes on to discuss St John's forthcoming plans; Reuters's interest in Russia and Northern Persia, and not Southern Persia, being his reason for not pursuing any opportunities with them; William Mackinnon and Edwin Sandys Dawes's interest in opening up the road from Shuster [Shustar] to Isfahan; and the Shah's [Naser al-Din Shah Qajar] visit to England. 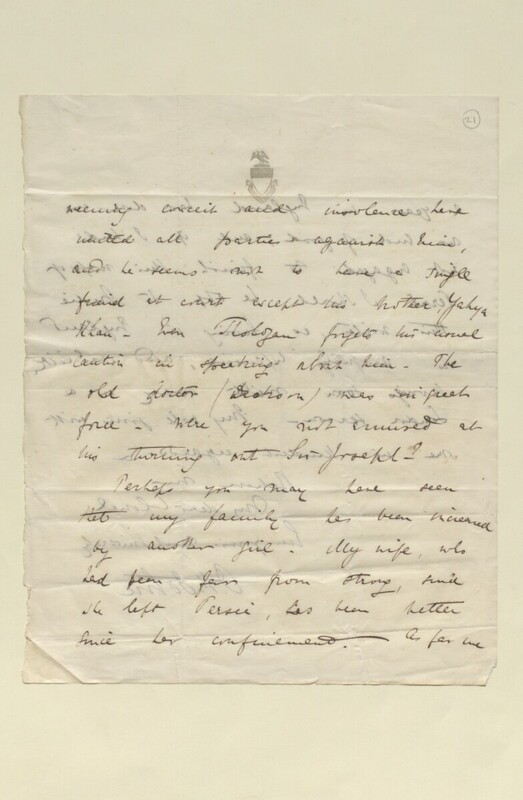 The letter concludes by informing Pelly of the arrival of his latest child, a daughter, his wife's recovering health since leaving Persia; and his work in producing a map of Persia.